Hamilton city council passed a measure that will save big money for developers who restore heritage buildings. Two brothers turning an old school in Dundas into condos will be the first to benefit. City Hall has shown no great love for our architectural history. But Tuesday, as a big-windowed wonder takes shape at the very foot of the escarpment, let’s give credit where credit is due. Last year council amended the development charges bylaw. Now, if someone restores a protected heritage property, the development fees will be waived. This is a big deal. And in a few weeks, Hamilton city council is to approve the first application of this new measure. It will be worth $657,219, and the development-fees break goes to Mike and Dave Valvasori, local brothers who have a good reputation for giving old buildings new purpose. Their latest job is Dundas District High School, which opened 84 years ago on an old mill property at the west edge of town. If scenery sells, this project can’t miss. The three-storey structure, with textured brick and fine stone detailing, was the first high school in Dundas, built long enough ago that the girls entered through one grand set of doors, the boys another. Each gender had to charge past a couple of scary carved-stone gargoyles. 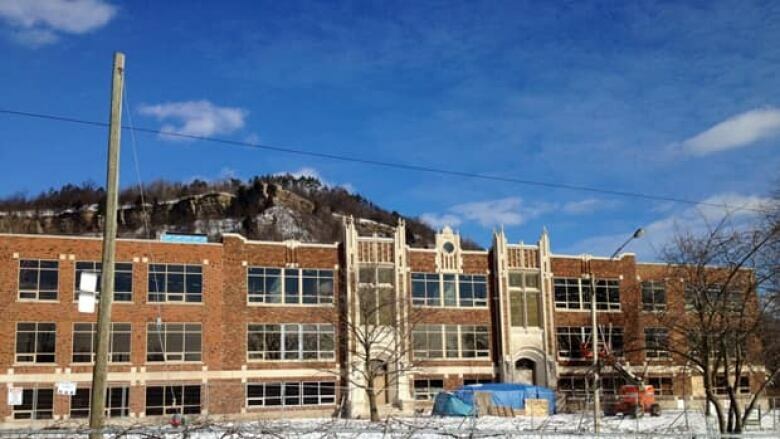 It seems an odd place to build a school, tucked right in by a waterfalls, cliffs of the escarpment all around. But the land was free, donated for the express purpose of education by Robert and Frank Fisher, who ran a mill there. Dundas grew, and so did the school. There were four additions, but none marred the building’s original Collegiate Gothic style. At one time, the student population was more than 500. New high schools got built in Dundas and old District was set aside. It did find new life as a middle school, then closed permanently six years ago. The school went on the market. Some in the trade came by, checked it out and walked away. But Mike Valvasori says he and his brother liked what they saw here. "Old schools are very structurally sound." The brothers bought Dundas District for $600,000. Work is underway on a project with a sales value of $18 million – 44 one and two-bedroom units, from $270,000 to $800,000. So it won’t be long before the money the city surrendered in development fees comes back in new property taxes. This project was set to go ahead before council voted to waive development fees, but Valvasori says the break is welcome. Especially when it turns out they now have to build a $500,000 wall. This school was crowded with kids for generations, and apparently nobody worried about the trains that roll past, halfway up the escarpment. But these are different times, and present regulations require that the residents of those 44 units be protected from all hazards. So the brothers must build a crash wall, enough to hold back a locomotive pulling four cars. It will be 300 feet long, 10 feet high, 2 1/2 feet thick, all amply reinforced with steel. And there was a hearing before the Hamilton Conservation Authority, which had wanted more flood protection than is provided by a wall now in place. The Valvasoris spent nearly $200,000 for consultant fees and digital mapping to show that the property was already well protected. City councillor Russ Powers spoke for them at the HCA, saying that if the kind of storm being talked about ever did hit, all of Dundas would be washed into Westdale anyway. Powers wanted to see this project go. It is where he went to school, and where he met his beloved late wife Linda. Under a big blue tarp, mason Gus Rosati is crafting a sign out of limestone for the District Lofts. Valvasori says that with no advertising at all, they’ve already had plenty of interest. Marketing will start in the spring. The first units should be ready in the fall, with the project complete by summer of next year. Dundas District has been on the list of properties to be designated for years. But the research required is labour-intensive, and the city heritage staff is smaller than ever. They can only do about four designations a year. But with Dundas District, there’s a shortcut. Instead of designating the building, an easement will protect its features. Such an easement remains in place whenever a property is sold. The same streamlined process could have been applied to Sanford Avenue School, near Barton and Wentworth. But even with the carrot of zero development fees, developers weren’t lining up to take on that project because of its inner-city location. Besides, the school board is in a hurry to knock that one down. Demolition is expected next month. And then there’s magnificent Delta secondary on Main East, set to close in a few years. Valvasori says they’ve already been contacted about that one. "It’s a beautiful shell, but it’s a different location," he says. Costs of restoration are the same as in Dundas, but each condo unit would fetch far less. Still, Valvasori isn’t saying no to Delta yet. "You have to walk through," he says. "You have to spend some time just imagining what it could be."